A photograph of the venue is all we need to create this beautiful illustration. Wedding venue UNFRAMED or in a white FRAME, both options are supplied mounted. A photograph of the wedding venue is all we need to create this beautiful personalised wedding gift illustration, fully personalised with the couples names, wedding date and the name of the venue. Making for a perfect wedding anniversary of wedding gift. UNFRAMED or FRAMED and mounted keepsake. 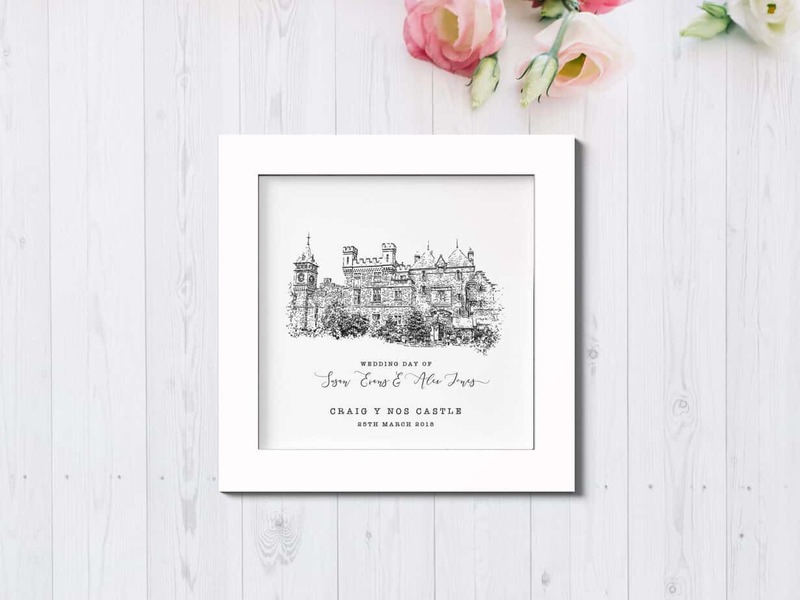 A beautiful wedding venue illustration keepsake, digitally created from a high resolution photograph of the venue, emailed to: keepsakesbyrebecca@yahoo.co.uk or via message to seller link. (if scanned please ensure it is scanned at 300dpi). Please send the name of the couple, venue name, wedding date and high resolution image of the venue in the note to seller box when purchasing. You can also purchase your design on ceramics – all printed on fine bone china and are dishwasher and microwave safe. Please send a message for more information.